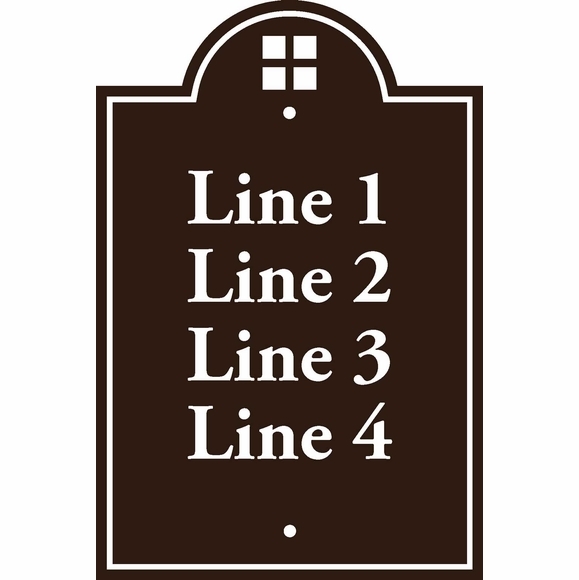 Custom 4 Line Sign - Multi Unit Address Numbers, Room Numbers, Building Numbers, Text, etc. Home > Address Plaques > Address Signs > Custom 4 Line Sign - Multi Unit Address Numbers, Room Numbers, Building Numbers, Text, etc. Custom Sign 4 Line 12x18 Wall Plaque - - says whatever needs saying. Decorative signage meets your specific requirements with the four lines of text you supply. Often used as an address sign for multi units with up to four sets of numbers, building numbers, room numbers, private property, no cell phones, smile you're on camera, etc. Made in USA. Made of 0.080" flat aluminum and vinyl lettering. Decorative grid medallion at the top is standard. Each line holds up to nine (9) 1.75" characters and starts with a capital letter as shown. Crisp border accentuates the hybrid rectangle shape. Small images shown in this order: black with white reflective, white with black, black with gold metallic, oil rubbed bronze with white reflective. Custom Sign With 5 Lines - Multi Unit Address Numbers, Room Numbers, Building Numbers, Text, etc. Large Custom Sign with 4 Lines And Floral Accent - For Multi Unit Address Numbers, Room Numbers, Building Numbers, Text, etc. Custom Sign with 5 Lines And Scrollwork Accent - For Multi Unit Address Numbers, Room Numbers, Building Numbers, Text, etc. Large Custom Sign with 5 Lines And Floral Accent - For Multi Unit Address Numbers, Room Numbers, Building Numbers, Text, etc. Large Custom Sign with 5 Lines And Monogram - For Multi Unit Address Numbers, Room Numbers, Building Numbers, Text, etc.